Successfully Added MXQ Android TV Box - Kodi V16.0, Quad Core CPU, 4x USB, H.265 Decoding, Airplay, DLNA, Miracast to your Shopping Cart. 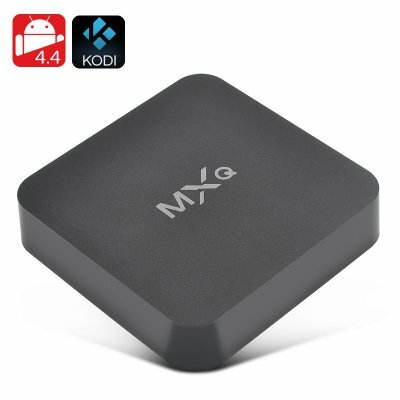 The MXQ TV box comes with is a fully equipped Android TV media player and with Kodi 16.0 preinstalled you're ready to go right out of the box. This compact Android smart TV box has an Amlogic Quad Core processor that positively zips along at 1.6GHz, when combined with the 1GB of RAM and a Mali 450GPU there is enough oomph for all your multimedia needs and entertainment so you can play games and videos to your heart's content. With support for H.265 decoding this media player can decode 4K video files and will bring them to you in full HD resolutions so you can access all the latest content in a full range of formats and enjoy them on your TV. Thanks to the Android operating system and stellar support you can even use Miracast, Airplay or DLNA for steaming media and games directly from your tablet or Smartphone allowing you to use them on the big screen. Google Play is already installed brining you access to a wealth of apps, games and utility software. making this a great home entertainment system for the full family. The MQX smart TV box comes with a 12 months warranty, brought to you by the leader in electronic devices as well as wholesale Android TV Boxes..